Lunar Ray Games is an independent game company founded by Bodie Lee in 2014. We aim to create games using nostalgic elements from our favorite SNES and PSX titles: beautiful pixel-art, addicting music, tight gameplay, and tons of exploration. Our current project, Timespinner, is a 2D Metroidvania Platformer being developed for Windows, Mac, Linux, PS4, PS Vita, and Nintendo 3DS. Hey everyone! Sorry I haven't kept this page up to date. Timespinner is coming out soon on PC/Mac/Linux! and PS4+Vita! We're now hosting weekly Development Livestreams every week on our Twitch Channel! Tune in every Tuesday at 1PM PST to watch the creation of Timespinner! Wow! What an incredible month! The Timespinner Kickstarter was funded in its first week and the game was Greenlit on Steam in just 2 weeks! Not only did the campaign reach its 50k goal, but we managed to raise over $176,000 in one month! Awesome! With these extra funds we will be able port Timespinner to the PS4, PS Vita, and Nintendo 3DS! Now begins the planning phase of development as we bring talented people on board to guarantee that Timespinner will live up to its success! Stay tuned for more news! If you like what you see, please consider sharing the campaign with friends! The Timespinner Kickstarter Campaign is going LIVE tomorrow evening! (That's Wednesday PST). 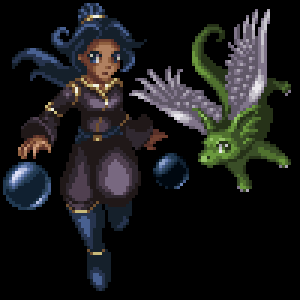 To tide everyone over until then, here's some Super Sprites of Timespinner's protagonists, Lunais and Meyef! The Lunar Ray Games and Timespinner presskit pages have been updated! Hurray! Hello everyone! Jeez, it's been awhile since our last update- sorry about that! These past two months have had us super busy getting the game ready for the Kickstarter campaign! Stay tuned for more updates on the upcoming Kickstarter! Timespinner's first gameplay teaser clip is now on YouTube! Enjoy the amazing music composed by Jeff Ball :D! Follow the community feedback on the forum page here: Timespinner TIGSource forum post. © 2014 Lunar Ray Games, All Rights Reserved.